Jazz has countless possible combinations. Through Pianeti Affini (trans. 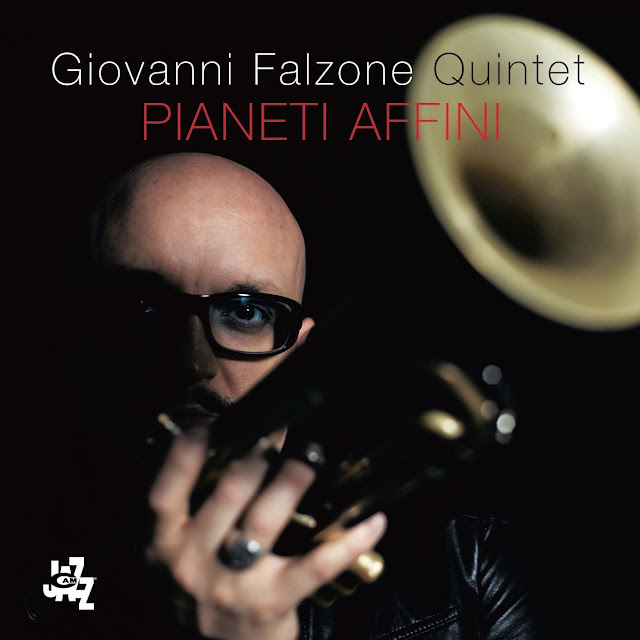 “Kindred Planets”) Giovanni Falzone and CAM JAZZ tried out an unusual quintet consisting of trumpet, accordion, trombone, bass and drums and, last but not least, electronics. Throughout more than an hour of music, these six instruments just kept pulling apart and then coming together again in an endless variety of amazing expressions of sound, timbre, rhythm and harmony that are forceful or vibrant and syncopated or hallucinogenic, poignant, distressing or graceful. All the elements in jazz must be mixed with non-stop imagination to obtain this wealth of designs: improvisation, pressing interaction, exchanges, swing and playfulness, but also all the technical and formal exactness required to “create as they go”. On further reflection, like some breathtaking fireworks, the most stunning musical forms, even impromptu forms, only develop when precise conditions – rules – processes exist, failing which such forms would be unfeasible. Exactness enables the conveyance of the true richness of this musical genre and unveils the underlying, unexpected similarities between worlds that only appear distant. 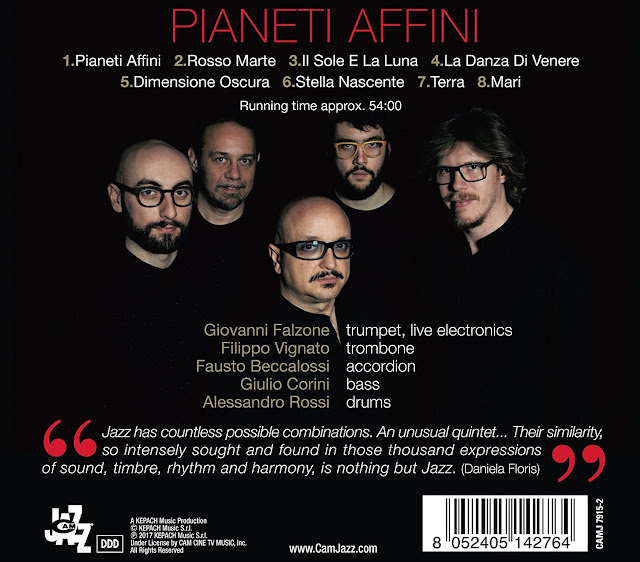 Listening to Giovanni Falzone on trumpet, Filippo Vignato on trombone, Fausto Beccalossi on accordion, Giulio Corini on bass and Alessandro Rossi on drums makes us discover five Kindred Planets. Their similarity, so intensely sought and found in those thousand expressions of sound, timbre, rhythm and harmony, is nothing but Jazz. Naming an uncompromising jazz album in commemoration of a soccer victory is not as strange as it may appear, for sports and the creative arts share an ability to unite diverse people in a sense of community that grows rarer every day. As we become ever more autonomous, as civic and religious ties continue to fray, sports and the arts remain the stages that bring us together and unite us in our passions. The cheers that are heard on “Viva Belgrano” echo those we encounter when the best musicians touch us with their passion, imagination and soul. I’ve heard Oscar Feldman have that effect on a crowd, whether at a large festival like that in Punta del Este, Uruguay, where I first heard him perform, or in the closer quarters of Buenos Aires’ legendary coffee house El Tortoni, where I was privileged to hear him sit in with one of his mentors, pianist Horacio Larumbe. The saxophonist’s technique is beyond reproach, and his ideas are fresh and commanding, but what really got to me and the other listeners was his passionate, attention-grabbing sound. Feldman was born and raised in Cordoba, Argentina, where his father was the Director of Culture and owned an art gallery. “He had bought a saxophone to learn himself, but quickly realized that he didn’t have the time to develop like Coltrane and the other guys he was listening to on records. I got his sax in 1976, and really started to grow when I went to the local conservatory in ‘78,” Feldman explains. After becoming a founding member of the band Los Musicos del Centro and working with two of South America’s most influential artists, Hermeto Pascoal and Dino Saluzzi, Feldman moved to Buenos Aires, where he became immersed in that city’s jazz scene for the next decade. 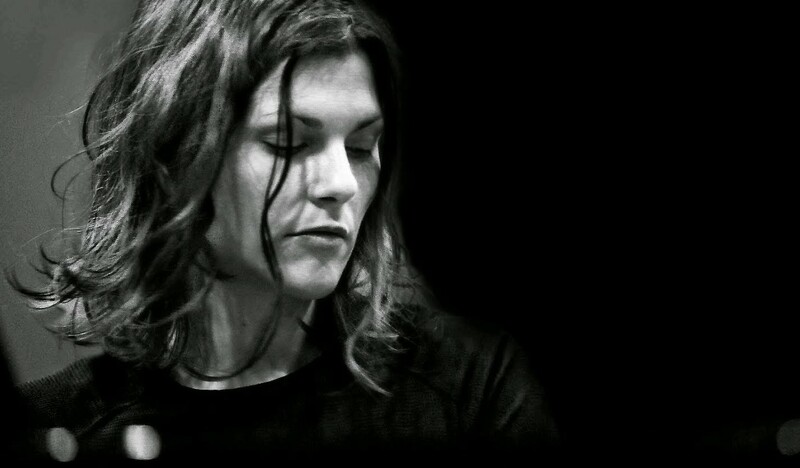 In 1992, Feldman won a scholarship to Berklee College in Boston. 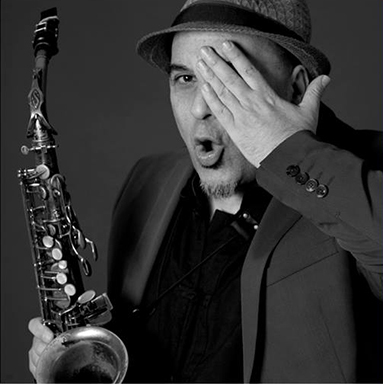 When his studies were complete, he moved to New York, and over the past two decades has been heard with leaders including Al Di Meola, Paquito D’Rivera, Dave Samuels and Bebo Valdes. He has also previously recorded under his own name, most recently on the 2009 release Oscar e Familia (Sunnyside). 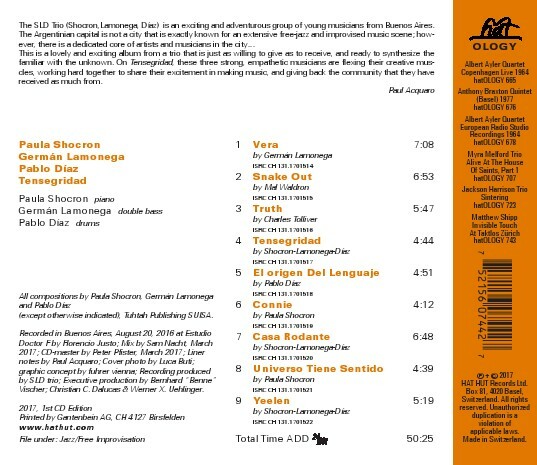 While original compositions were well represented on that collection, GOL (= goal) includes only one. “These are songs that I’ve been playing for a while, and each piece has gotten to the point where it feels like mine,” Feldman notes. “The program reflects how I want to hear music as a listener.” It is also well balanced between Feldman’s two primary horns, the soprano and alto saxophones. I Let a Song Go Out of My Heart is an arrangement originally written for Paquito D’Rivera. By stretching the meter, Feldman gives a more contemporary spin to the Ellington classic. “Just repeating something as wonderful as Johnny Hodges’ approach would be pathetic,” Feldman insists. “I want to transform standards so they become one of my songs.” He does the job here with an alto solo that builds in emotion, a path that Genovese also pursues in the subsequent piano choruses. Composer Klein’s vocal is featured on La Cancion Que Falta. Feldman translates the title as “The Song That is Missing,” and notes a double entendre in the line where the singer says that he will “give it to her,” which reflects the combination of force and tenderness in the soprano solo. After Genovese’s spot, Feldman gives his own heartfelt reading to the mesmerizing melody. Murmullo is a traditional Cuban bolero popularized in the 1930s by composer Electo `Chepin' Rosell's band `Chepin-Choven’. “It’s a very old one,” Feldman confirms. “I played it with a singer and found it so simple and beautiful, a change from the typical ballad standard.” It gets his juices flowing on soprano, and also features a commanding bass solo by Benitez. Is That So? which shows no strains in its finger-popping rhythm, hides its challenges in its structure. Feldman learned the Duke Pearson classic at one of the jam sessions he regularly attends in Manhattan Plaza, the midtown high-rise where he and many prominent artists live. “I wish I could write like that, straight-ahead but unique, where it sounds easy until you try to play it,” he comments, though any formal shifts are traversed smoothly in the alto and piano solos. For variety, Benitez and Sanchez trade eights. 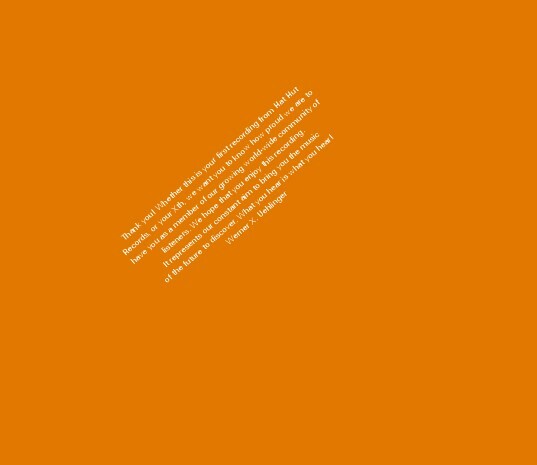 For the collection’s final transformation, Feldman plays I Feel Fine in a soulful seven, with the bridge set at a slower waltz tempo. “Many people do harmonic modulations, but I find meter modulations interesting, and they work well with this harmony. I love the way it gets `smoky’ at the bridge, then goes back to reality. It has a blues feeling in the main melody, then the bridge gives the improvisers a surprise. 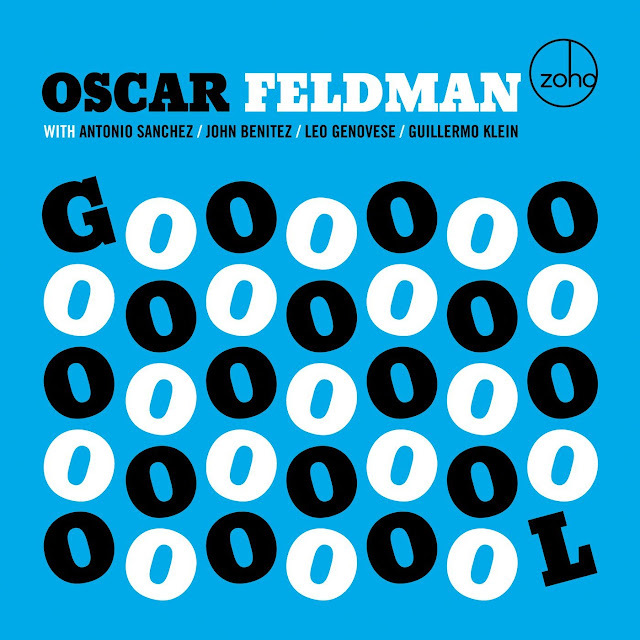 You have to change emotional and musical gears to tell the story.” This presents no problem for Feldman (on alto) and Genovese, and takes “GOL” out with a return to a mood of unbridled celebration. Produced by: Oscar Feldman. Recorded at: Bacque Recordings, Roselle, NJ on June 14 and 15, 2015. Recording and mastering engineer: Luis Bacque. Studio photography by: Maria Postigo. Album cover and design by: Fran Pontenpie. Executive Producers: Robert Powley, Joachim “Jochen” Becker. 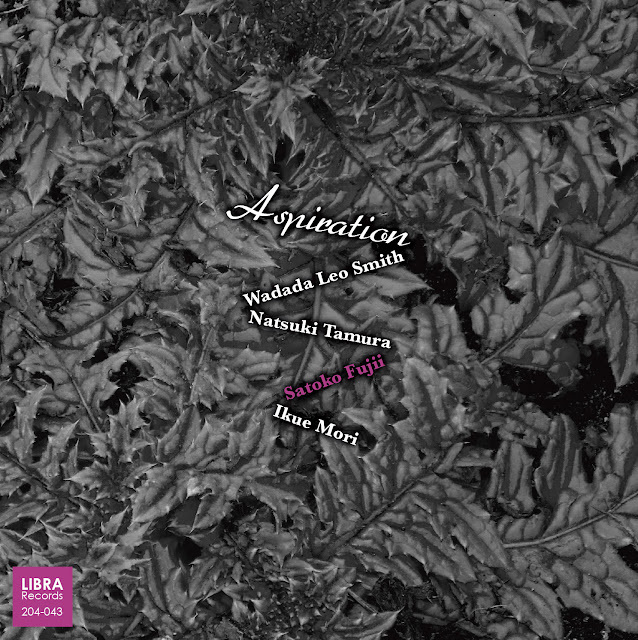 The group chemistry is magical on pianist-composer Satoko Fujii's Aspiration, featuring an all-star quartet with trumpeters Wadada Leo Smith and Natsuki Tamura, and laptop player Ikue Mori. The nearly telepathic link among them takes the music into places where it grows ever deeper and more intuitive. Each track on the album is so vividly alive in the moment and with a character so distinct that it seems to become an animate thing independent of its creators. The artists are almost subservient to the music rather than the other way around. The album will be released September 8, 2017, via Fujii's Libra Records. It's little wonder the album is so subtle and intimate, given the artists involved. Although this is the first time they have worked together as a group, there are ties among them that contribute to the music's beauty and coherence. Smith and Mori displayed an uncommonly close rapport during their duets on Smith's Luminous Axis (Tzadik). "I knew Wadada and Ikue had worked together before," Fujii says, "but that's not why I asked Ikue to join us. Natsuki and I had played with Ikue before on several occasions and we had a great time. 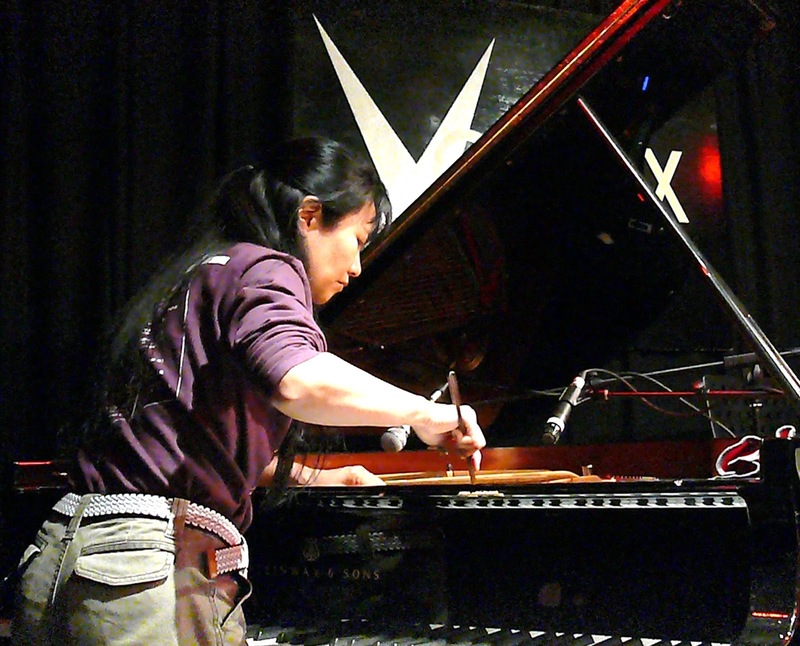 When I started composing for the project with Wadada, I heard Ikue's sound in my ears." Of course, Fujii and Tamura share an intimate bond developed over several decades of working together and especially in their duo music, which they've recorded five times since 1997. Once they came together in the studio, creating the music was easy, Fujii says. "I could feel a kind of calm confidence when we were together. I knew that we were going to make good music." Fujii's intuition about the quality of the music proved correct. 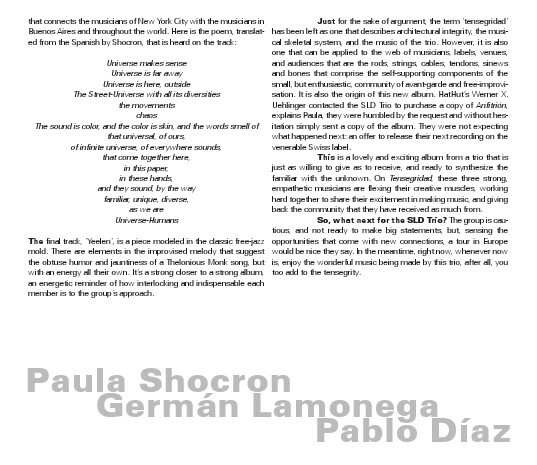 They venture into the mysteries and potentials - and the risks - of the quartet with fearless openness and discipline. On each track, every aspect of sound production is in spontaneous flux-rhythm, melody, dynamics, texture, density, silence. There is no telling where the music may lead. On "Intent," the unfixed quality keeps the listener on edge in anticipation of where the music will flow next. As the members of the band move in and out of the music, each sonic event blossoms with vibrant immediacy, and fades away as the music evolves. "Floating" opens with extraordinarily graceful piano from Fujii while Mori orchestrates textures and rhythms in parallel to her. About five minutes in, Smith makes a dramatic entrance and a three-way conversation ensues before Tamura brings the piece to a quiet ending. It's one of the most elusive and obliquely lyrical tracks on the disc, and there isn't a note out of place. Tamura's "Stillness" is a piece of complementary contrasts with a contemplative start that suddenly erupts into roiling energy and subsides. Again, there's a sense of inevitability that feels organic. Even the unaccompanied solos that crop up throughout the performances-for instance, Tamura's sculptural opening to "Evolution," or Fujii's solo later in that same piece-are shaped to function within the context of the composition. Fujii, Smith, Tamura, and Mori gathered without preconceived notions about what must happen as they play. Instead they discovered together what the music could do, and nurtured it to its fullest expression. In the end, Aspiration is about more than music-it is about sharing and working together, about finding something beautiful and making it more so, and about the spiritual bonds that unite us all. Critics and fans alike hail pianist and composer Satoko Fujii as one of the most original voices in jazz today. She's "a virtuoso piano improviser, an original composer and a bandleader who gets the best collaborators to deliver," says John Fordham in The Guardian. In concert and on more than 80 albums as a leader or co-leader, she synthesizes jazz, contemporary classical, avant-rock and Japanese folk music into an innovative music instantly recognizable as hers alone. Over the years, Fujii has led some of the most consistently creative ensembles in modern improvised music, including the ma-do quartet, the Min-Yoh Ensemble, and an electrifying avant-rock quartet featuring drummer Tatsuya Yoshida of The Ruins. She has also established herself as one of the world's leading composers for large jazz ensembles, leading Cadence magazine to call her, "the Ellington of free jazz." Her ultimate goal: "I would love to make music that no one has heard before." Trumpeter and composer Natsuki Tamura is internationally recognized for his unique musical vocabulary blending extended techniques with jazz lyricism. 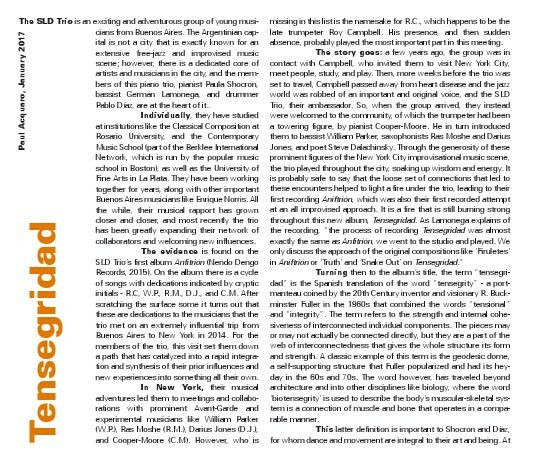 This unpredictable virtuoso "has some of the stark, melancholy lyricism of Miles, the bristling rage of late '60s Freddie Hubbard and a dollop of the extended techniques of Wadada Leo Smith and Lester Bowie," observes Mark Keresman of JazzReview.com. Throughout his career, Tamura has led bands with radically different approaches. On one hand, there are avant rock jazz fusion bands like his quartet, whose album Hada Hada Peter Marsh of the BBC described this way: "Imagine Don Cherry woke up one morning, found he'd joined an avant goth-rock band and was booked to score an Italian horror movie." 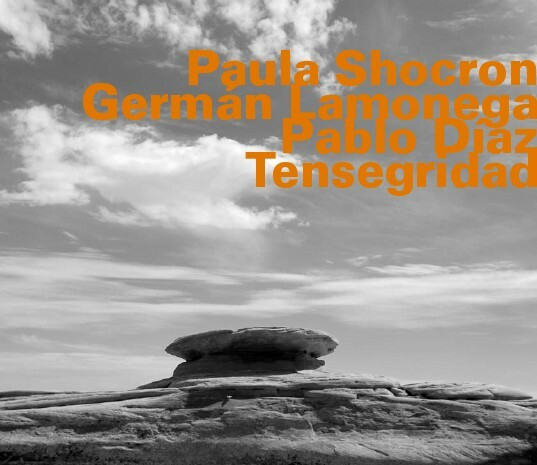 In contrast, Tamura has focused on the intersection of folk music and sound abstraction with Gato Libre since 2003. 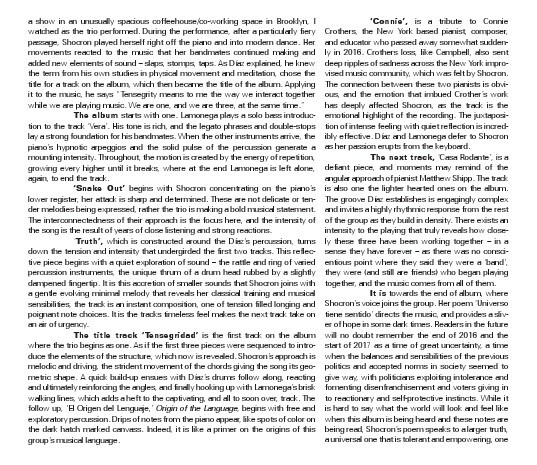 The band's poetic, quietly surreal performances have been praised for their "surprisingly soft and lyrical beauty that at times borders on flat-out impressionism," by Rick Anderson in CD Hotlist. In addition, Tamura has recorded five CDs in his ongoing duo with pianist (and wife) Satoko Fujii. Tamura also collaborates on many of Fujii's projects, from quartets and trios to big bands. As an unaccompanied soloist, he's released three CDs, including Dragon Nat (2014). He and Fujii are also members of Kaze, a collaborative quartet with French musicians, trumpeter Christian Pruvost and drummer Peter Orins. "As unconventional as he may be," notes Marc Chenard in Coda magazine, "Natsuki Tamura is unquestionably one of the most adventurous trumpet players on the scene today." A finalist for the Pulitzer Prize in Music, trumpeter, multi-instrumentalist, composer, and improviser Wadada Leo Smith is one of the most boldly original and influential artists of our time. Transcending the bounds of genre or idiom, he distinctly defines his music, tirelessly inventive in both sound and approach, as "Creative Music." For the last five decades, Smith has been a member of the legendary AACM collective, pivotal in its wide-open perspectives on music and art in general. He has carried those all-embracing concepts into his own work, expanding upon them in myriad ways. Smith received the 2016 Doris Duke Artist Award and earned an honorary doctorate from CalArts, where he was also celebrated as Faculty Emeritus. In addition, he received the Hammer Museum's 2016 Mohn Award for Career Achievement "honoring brilliance and resilience." In 2017 Smith topped three categories in DownBeat Magazine's 65th Annual Critics Poll: Jazz Artist, Trumpet and Jazz Album (for America's National Parks on Cuneiform.) Smith was also honored by the Jazz Journalists Association as their 2017 Musician of the Year as well as the 2017 Duo of the Year for his work with Vijay Iyer. Born December 18, 1941 in Leland, Mississippi, Smith's early musical life began at age thirteen when he became involved with the Delta blues and jazz traditions performing with his stepfather, bluesman Alex Wallace. He received his formal musical education from the U.S. Military band program (1963), the Sherwood School of Music (1967-69), and Wesleyan University (1975-76). Smith has released more than 50 albums as a leader. His 2016 recording, America's National Parks, a six-movement suite inspired by the scenic splendor, historic legacy, and political controversies of the country's public landscapes, earned a place on numerous best of the year lists including the New York Times, NPR Music and many others. Smith's landmark 2012 civil rights opus Ten Freedom Summers was called "A staggering achievement [that] merits comparison to Coltrane's A Love Supreme in sobriety and reach." 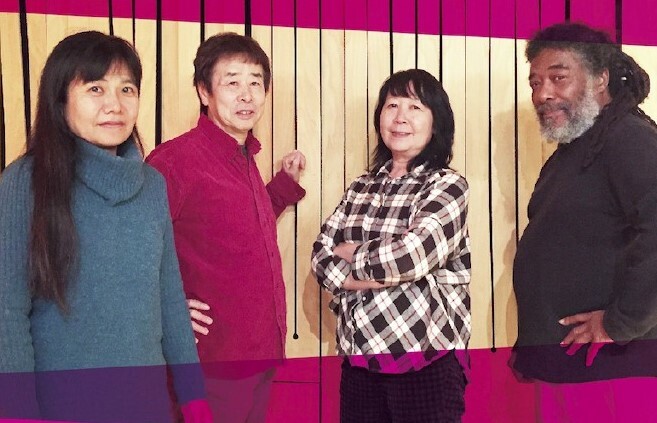 Laptop musician, composer, and percussionist Ikue Mori first gained attention in the late '70s as the drummer in the seminal No Wave band DNA, with fellow noise pioneers Arto Lindsay and Tim Wright. In the mid '80s she started in employ drum machines in the context of improvised music. While limited to the standard technology provided by the drum machine, she nevertheless forged her own highly sensitive signature style. In 2000 she started using the laptop computer to expand on her already signature sound, thus broadening her scope of musical expression. Mori has released more than 20 albums as a leader or co-leader with innovative bands such as Mephista with pianist Sylvie Courvoisier and drummer Susie Ibarra; and Phantom Orchard with harpist Zeena Parkins. She is a frequent member of ensembles led by John Zorn, and was a featured soloist with Ensemble Modern on guitarist-composer Fred Frith's Traffic Continues (Winter & Winter). 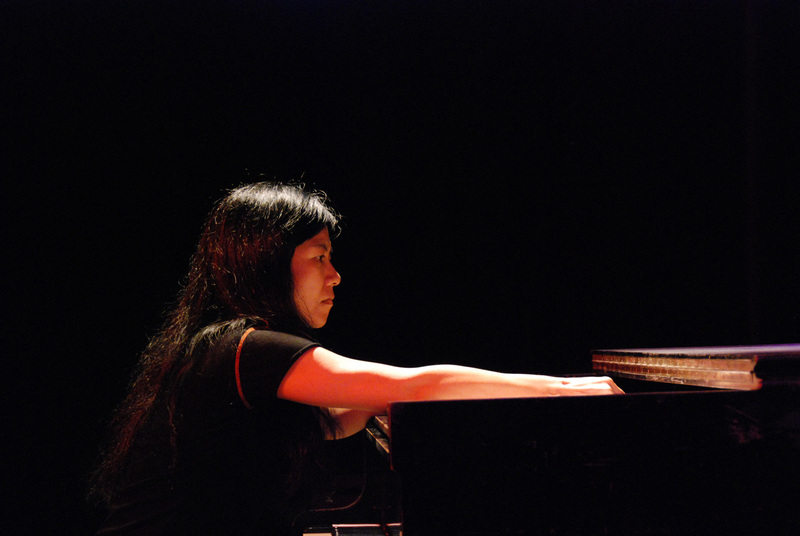 Her most recent releases are Obelisk with Courvoisier, Okkyng Lee, and Jim Black; and Highsmith, a duo with pianist Craig Taborn, both on Tzadik. Whether on her own highly-acclaimed albums, as a 25-year member of the beloved vocal group New York Voices, or as co-founder of two diverse and inventive supergroups, Moss and JaLaLa, singer/songwriter Lauren Kinhan has always forged her own path as a performer, composer and improviser. 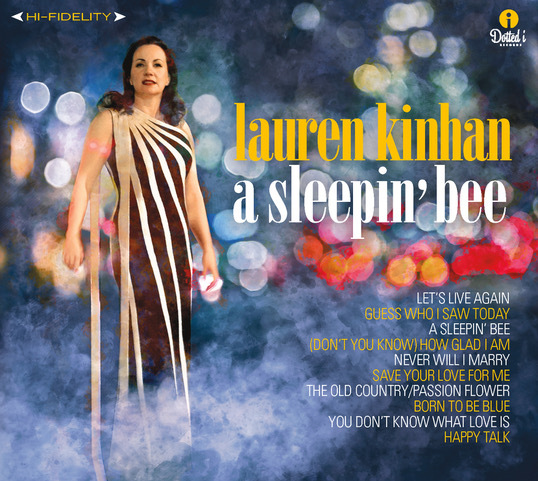 With her latest, A Sleepin' Bee (due out October 6 on her own Dotted i Records), Kinhan once again steers herself in unexpected directions with a new release that is at once the first all-standards collection of her career, a loving tribute to legendary vocalist Nancy Wilson, and unmistakably a Lauren Kinhan album - with all the unique perspective and idiosyncratic personality that has come to imply. If the sudden appearance of an album's worth of standards in a catalogue dominated by original songs comes as a surprise, the process of its creation is just as atypical. 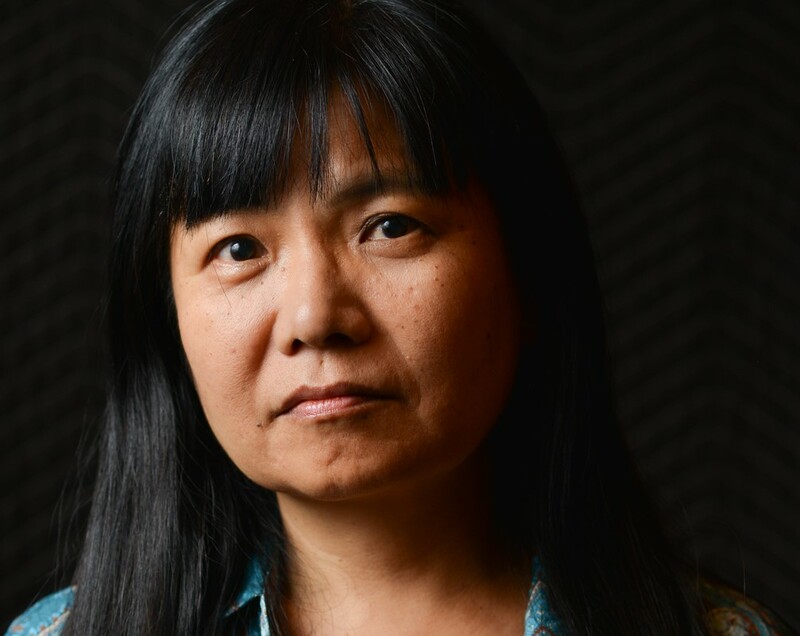 While Kinhan spent much of 2016 conceiving, rehearsing and workshopping the project, the circumstances of the recording arose suddenly through the auspices of her alma mater, Berklee College of Music. The session suddenly became an educational opportunity as well as a record date, providing a small group of Berklee students the invaluable privilege of observing and engaging in a recording session at the highest level. First and foremost, though, A Sleepin' Bee is a celebration of Nancy Wilson on the occasion of the genre-hopping singer's 80th birthday. While Kinhan shares Wilson's penchant for blurring stylistic boundaries, her choice of material focuses on Wilson's early jazz albums, particularly her collaborations with Cannonball Adderley and George Shearing. Those recordings proved to be a jumping-off point for Kinhan, who utterly transforms these classic and obscure numbers with the help of pianist/creative partner Andy Ezrin and veteran producer Elliot Scheiner as well as a stellar band featuring bassist Matt Penman, drummer Jared Schonig and special guest trumpeter Ingrid Jensen. With three brilliant albums of her own songs under her belt, not to mention her game-changing work with three distinctive vocal groups and wide-ranging collaborations with singular artists from Ornette Coleman to Bobby McFerrin, Kinhan decided it was finally time to create an album more in line with the jazz tradition of interpreting a book of standards. Of course, Kinhan has never been one to follow an obvious route, so the results quickly became something wholly her own. "I approached this project similarly to the way I write songs, except that in this case that creativity was expressed in the arranging and approach to the lyrics," she explains. "I wanted to make an album that was inspired by Nancy Wilson but still conveys my point of view in the way that I think about, interpret and reimagine music." The starting point for the project quickly became Nancy Wilson/Cannonball Adderley, the 1961 album on which the 24-year-old singer was backed by Adderley's incredible quintet with his brother Nat, pianist Joe Zawinul, bassist Sam Jones and drummer Louis Hayes. Kinhan had fallen in love with the album as a young girl searching through her parents' record collection, enamored with both Wilson's soulful voice and her elegant image. "I remember being 7 or 8, staring at the cover of this beautiful woman in a yellow dress and connecting with the songs, the arrangements and the bite of her tone. I know those songs like I know the songs of Carole King and Joni Mitchell. So revisiting them, they feel like a favorite cashmere sweater." The 12 tracks on Nancy Wilson/Cannonball Adderley were evenly split between vocal and instrumental pieces, and Kinhan interprets all but one of the vocal tunes on A Sleepin' Bee. To fill out the repertoire, she began delving into Wilson's catalogue - only reaching 1964 before she had more than enough to work with. The remaining repertoire is carefully cultivated from Wilson's early-60s releases, the bulk of it coming from The Swingin's Mutual!, Wilson's 1960 collaboration with pianist George Shearing. "In a way," Kinhan says, "A Sleepin' Bee is also a tribute to Cannonball and George Shearing and the fine musicians that played on the original recordings. The pairing of the voice and great players is what it's all about. It's never just about singing for me; it's the whole creative spectrum of arranging notes and form, and connecting with the musicians." Those elements are combined and rearranged in disparate and intriguing ways throughout A Sleepin' Bee, from the laid-back swing of "Let's Live Again" to the haunted melancholy of "You Don't Know What Love Is," whether stretching the melody like taffy on "Never Will I Marry" (parried by Berklee classmate Jensen's darting trumpet) or finding a playfully bold character at the heart of the title tune. She effectively melds Nat Adderley's "The Old Country" with Billy Strayhorn's "Passion Flower," and fully imbues "Born To Be Blue" with the remorseful mood inherent in its title. Kinhan's vulnerable, stripped-down version of "Save Your Love For Me" completely reimagines Wilson's iconic take - which Kinhan previously performed both with and for Wilson herself, first on a recording with the New York Voices and later with the Voices as part of Wilson's 2004 induction as a National Endowment for the Arts Jazz Master. Perhaps the most surprising inclusion is Wilson's debut single, "Guess Who I Saw Today," whose lyrics haven't exactly aged well. Kinhan puts a new twist on the tune not only with her sly vocal performance - which acidly comments on a song that frames its tale of infidelity with some decidedly Eisenhower-era social mores - but with an updated arrangement that makes the song her own, apart from Wilson's quintessential version. "You better have a perspective on this song, especially as a woman who's been an outspoken feminist my whole life," Kinhan says. "It's not that cheating is old-fashioned; it's the way that the story is pitched from the beginning, drawing an outmoded picture of marriage where the woman stays home, does the shopping and dotes on her husband, who spends his day at work. To chew on those words was so strange - but it was also fun to hold that mirror up to society and look at its absurdity." "(You Don't Know) How Glad I Am" was a fresh discovery for Kinhan in her research for the project. Despite Wilson's recording having won a Grammy in 1964, it was not that version but a less ornate live rendition that grabbed Kinhan's ear, and she takes a similar approach, powerfully singing with gospel-inflected soul accompanied only by Ezrin's lyrical piano and Penman's subtle bass. The at times inane lyrics of "Happy Talk" are sent up in a slapstick carnival atmosphere to close the album on a particularly offbeat note. Recording the album with multiple Grammy-winner Elliot Scheiner at Berklee's state-of-the-art Shames Family Scoring Stage meant turning the studio into a classroom, a prospect that at first seemed daunting but that Kinhan quickly embraced. "The students brought a performance atmosphere to the session that was beautiful," she says. "Normally recording sessions can make you incredibly self-conscious, often putting yourself under the microscope, but knowing there was an audience was really liberating. The students witnessed great players laying it down right in front of their eyes, and that made for an inspired environment. The added bonus of sharing Nancy Wilson's legacy with them was a Sleepin' Bee we hope to have reawakened for generations to come."